In my story last week, I made a brief mention of C.C. Pyle as the agent for both Red Grange and Suzanne Lenglen. Charles C. Pyle (sometimes referred to as “Cold Cash” Pyle, and more often as “Cash and Carry” Pyle) was responsible for bringing both stars to Toronto in the fall of 1926 … but he was looking to take something away with him too: the city’s professional hockey team – The Toronto St. Pats. 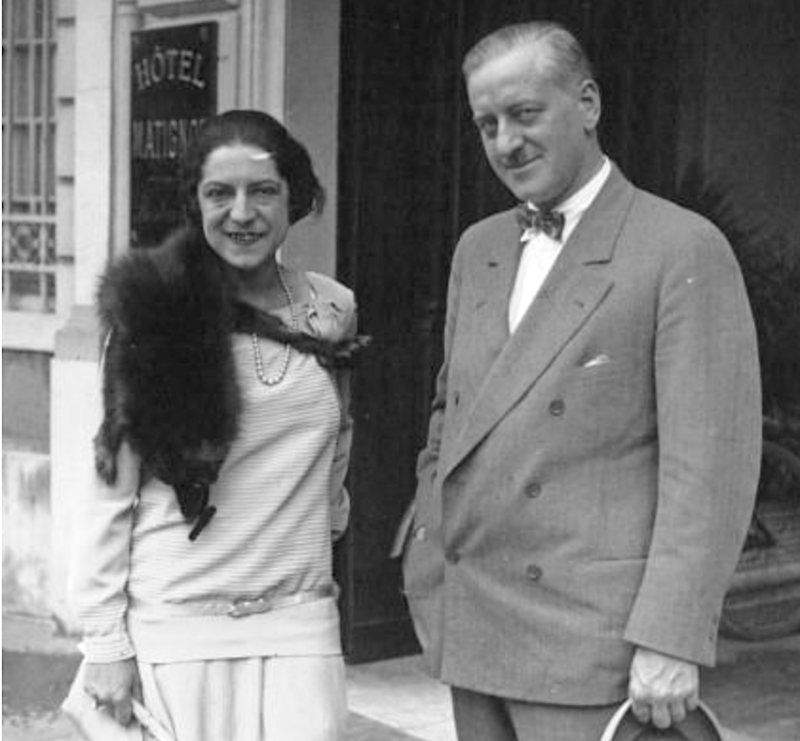 Suzanne Lenglen and her agent, C.C. Pyle. Writing in the Toronto Daily Star on October 8, 1926 (a few days before Lenglen’s appearance in the city), W.A. Hewitt noted: “Cash-and-Carry Pyle, who has Red Grange and Suzanne Lenglen under his wing, is trying desperately to break into professional hockey…” Hewitt wrote that Pyle had recently raised his original offer of $200,000 to $400,000 in an effort to buy the New York Americans, the NHL’s first franchise in The Big Apple. The Toronto Telegram had the story of Pyle’s interest in the St. Pats first on November 19. Other local papers, such as the Globe, shown here, didn’t have it until the next day. 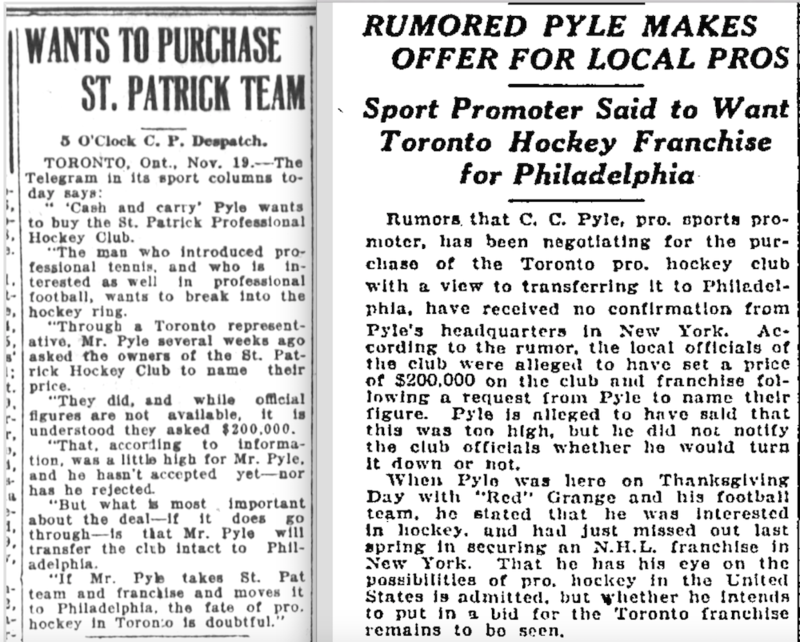 While it appears there would be more serious offers from Montreal investors (who likely would have left he team in Toronto) in the coming weeks, it was widely reported that if Pyle bought the St. Pats, he would move them to Philadelphia. Smythe used this threat of losing the city’s NHL team to an American city to rally his own group of investors and save the team in Toronto. He closed his deal on February 14, 1927, and renamed the team the Maple Leafs. How close did Toronto really come to losing its team in 1926? It’s hard to know for sure. But C.C. Pyle’s interest in hockey seems to have been genuine. In the spring of 1927, he and Red Grange bought a large rink in Los Angeles, made plans to build another in San Francisco, and announced their intention to establish a four-team California Professional Hockey League. The league would run until 1933, though Pyle and Grange sold their interests in it around 1929. Tex Rickard was starting up his Philadelphia Garden plans around this time, and would have been looking for an NHL club. I don’t know about a Pyle-Rickard connection, but Tex had worked through stalking horses before – as in Chicago the year before. There may well have been some sort of “We’re not letting you into New York, but I am building a rink in Philly…” going on between Pyle and Rickard. Never come across anything like that, though. Did that California pro league actually exist? What was it? The history of that California league is a bit confusing, as some records show it starting as early as 1925-26. I don’t know if Pyle turned it from amateur to professional, or if it already was a pro league and he just bought in. It seems a bit confusing. But it does appear to have lasted until 1933 … though, as I said, Pyle and Grange were gone several years before that. You can Google California Professional Hockey League, or check the SIHR web site for more. There’s even some players you may have heard of who played in the league. Most notably Jim Riley, who is the only player in history to play Major League Baseball and play in the NHL!